Bay Vista overlooks a large body of salt water with views of several islands, constant maritime activity and two iconic bridges. When the home was purchased, the property lacked an overall organization to its spaces, and was ready for a complete overhaul. After the initial phase, the purchase of the land next-door doubled the property size to about 7 acres. Where initially there had been a need for privacy screening, the scope for phase two called for a connection between the two properties and the siting of a large barn and terraced gardens. Historic stone farm walls bordered both properties, drawing them together and providing a natural, strong connection to the landscape’s history. The design philosophy was to create a private family compound with an emphasis on the exceptional views and open landscape. Featured areas in the first phase included site terracing, driveway relocation, a formal perennial garden, natural meandering azalea walkways, large stone steps between the multiple levels of the site, fish pond revitalization, and a series of terraces for dining, pool activities, and general relaxation. These spaces offer memorable experiences in nature while embracing the property’s unmatched scenery. 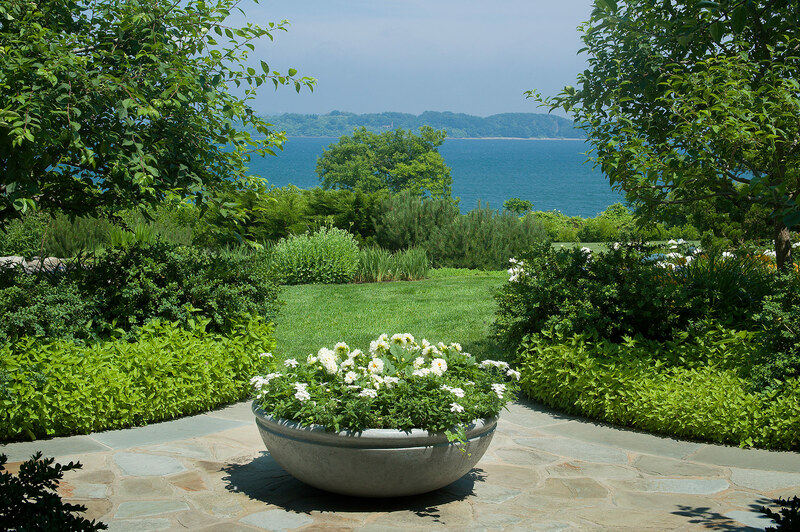 The overall scale of the property and house created opportunities for bold design and terracing, connecting the main floor of the house to the landscape one floor down. 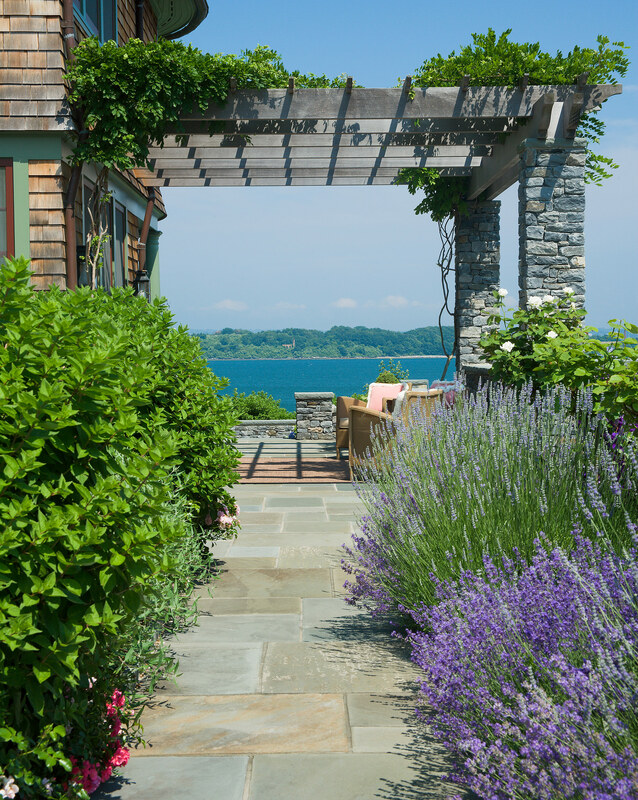 Retaining walls and the pool enclosure barriers are incorporated into the terracing to eliminate the need for fencing that would interfere with the dramatic views of the bay. 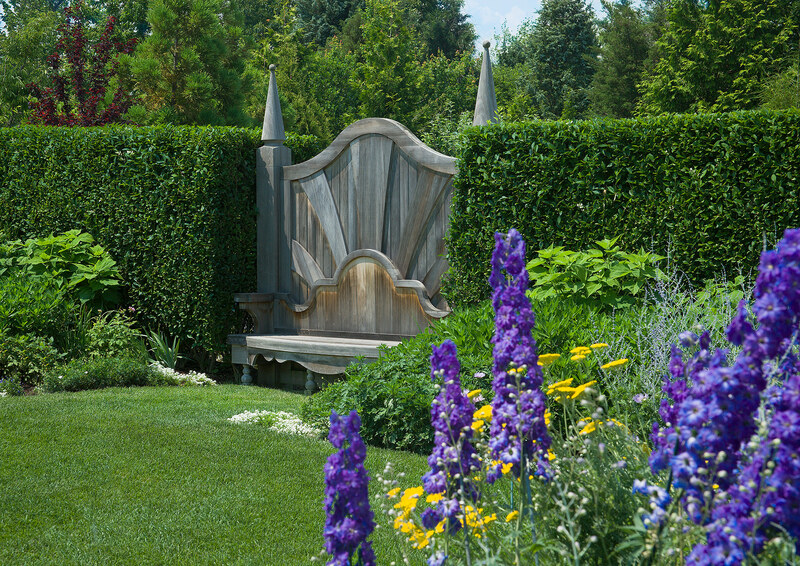 A custom-designed red cedar gate at the perennial garden features a large bench with a removable seat, which also doubles as a service gate for large events or functions. Wood furnishings were designed specifically for the east terrace. 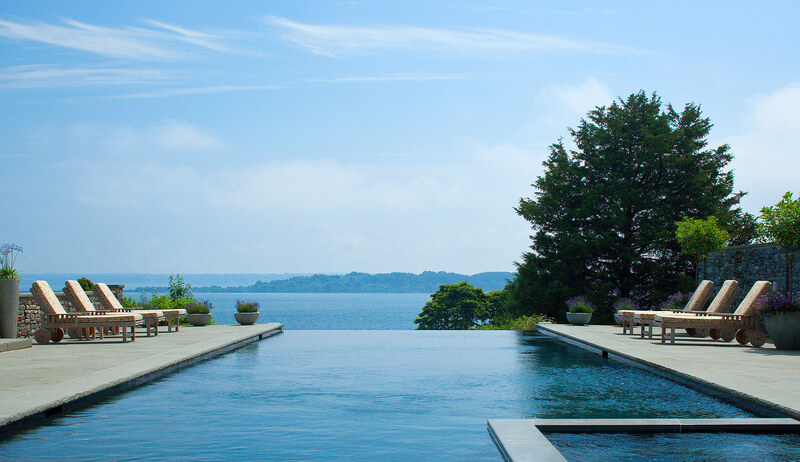 The gunite pool includes a polished granite infinity edge with an interior hue that mirrors the color of the bay. Carved bluestone corbels sit at the ends of the infinity edge. 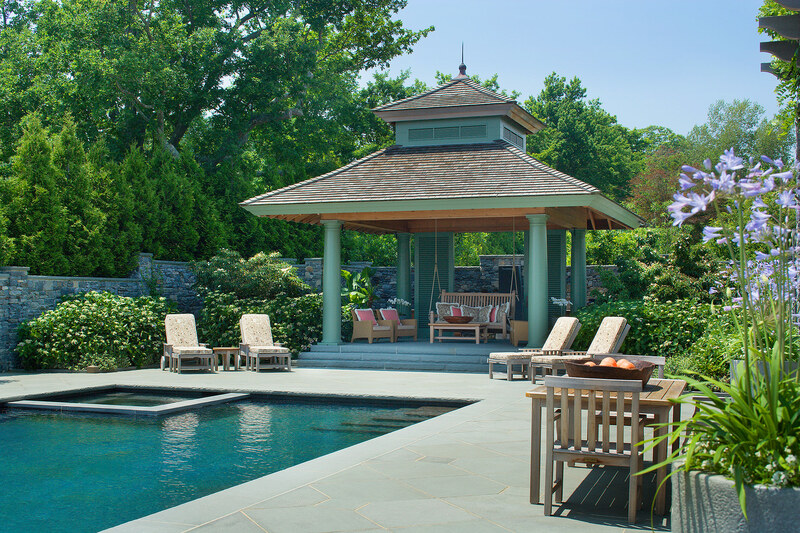 This heated pool sits within an intricate bluestone paving pattern and includes a spa. The pool pavilion rests on a raised bluestone platform for enhanced views of the water. Situated behind the pavilion is a monolithic granite outdoor shower with a waterfall spout and custom bronze controls. In phase two, the new barn building forms the physical transition between the upper and lower areas of the property. 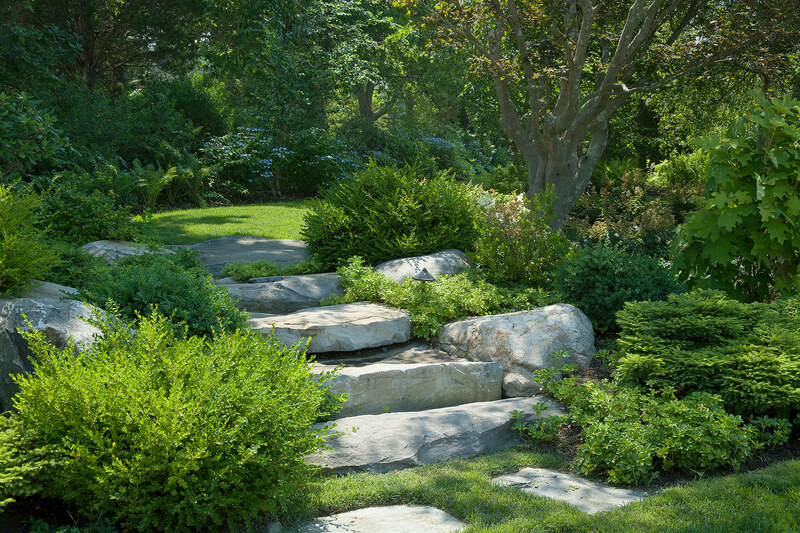 Large stone walls and boulder steps create garden terraces and meandering paths. 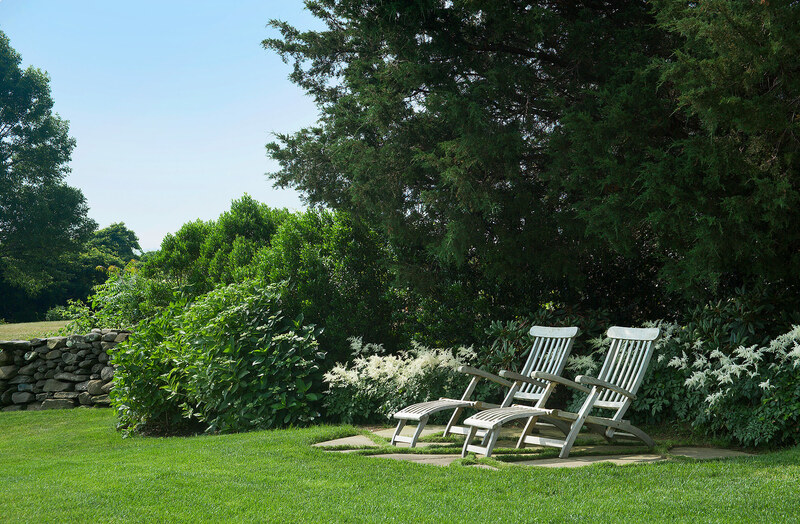 Due to the scale of the property and the client's passion for plant material, open lawns were reclaimed for a forest garden. 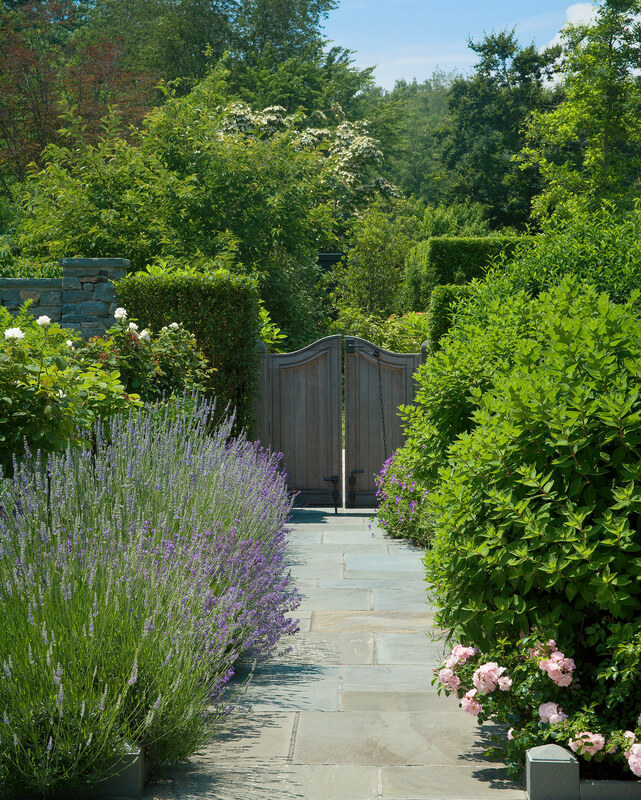 Large trees were brought in creating an instant canopy for an understory of collected azaleas and ephemeral plants. The walled motorcourt contains an apple orchard and the sunny slopes showcase a large selection of rock garden plants. The largest grade change occurs in the center of the site, aligning with the two-level barn. 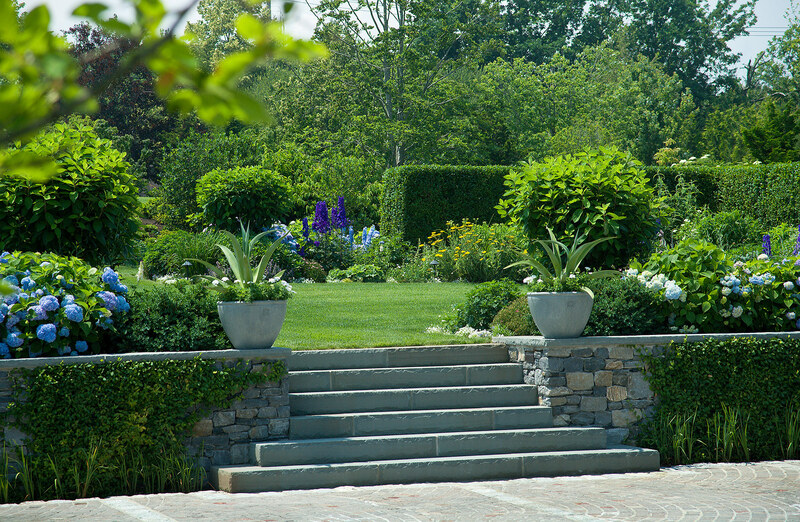 The tallest retaining wall is reduced in mass by the addition of a true planted wall and a raised perennial garden, with a focus on late summer bloom. 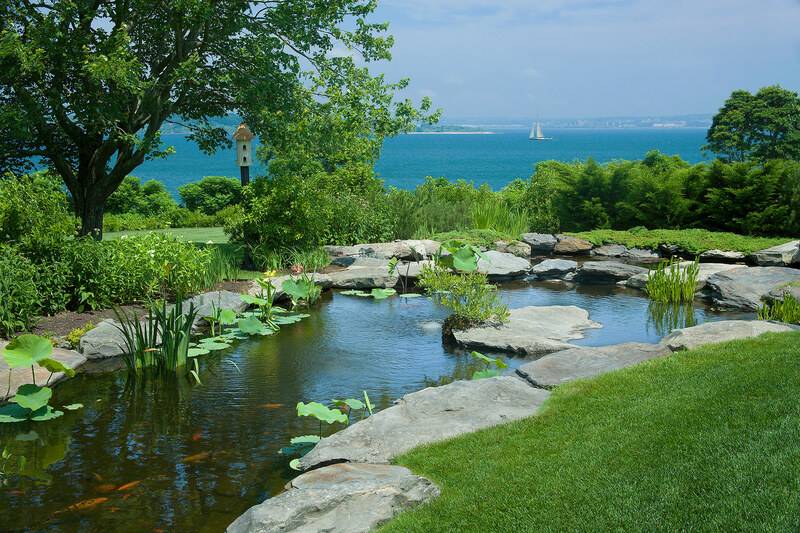 A large, existing fish pond was freed from invasive and overgrown plant species, and reconnected with the landscape surrounding the house and pool. The pond habitat was expanded to include an adjacent rain garden as part of the overall site drainage system. FURNISHINGS: Donghia, Weatherend, Southerland, Henry Hall, Lunaform, Katherine Field and Associates, Inc.